In today’s session, we are in part 3 of our Mindfulness series. In session 40, we introduced mindfulness and in session 41 we did an individual mindfulness exercise to calm our minds and really get in tune with what is happening with our thoughts and feelings. 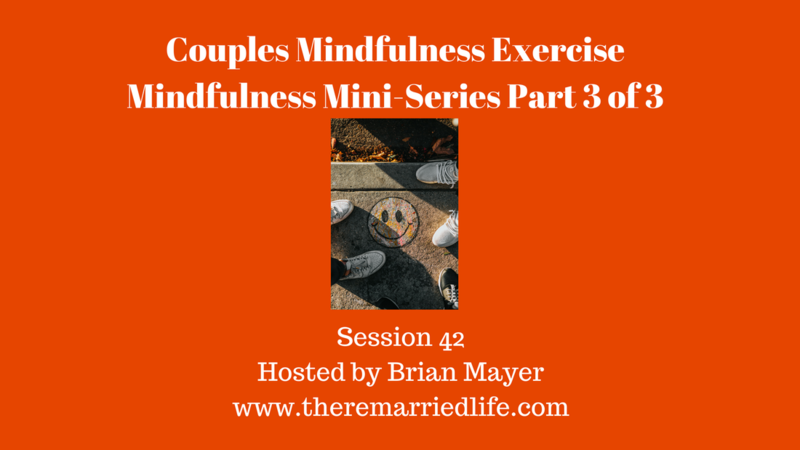 In this session 42, we will do a mindfulness exercise for couples. You are your partner should do this together. Remember mindfulness is simply becoming more aware of the present moment. In reality this is the only moment we really have. The past has already happened and the future will never really get here. Ensuring that we fully engage with what is happening in our mind and body in the present moment will ensure we don’t miss what is truly important. So for this exercise to work well there are a few things you each need to do to prepare. First, make sure you are both in a quiet place without interruption. So hopefully the kids are either in bed fast asleep or out of the house completely. Turn off all distractions like the television and your phones. If you are feeling overwhelmed emotionally because of an argument with each other or maybe some other stressor you might want to take a few moments to help each other calm down. You will be standing during this exercise unlike the previous individual mindfulness exercise in which you were either sitting or lying down. You should be in a larger room because you will first stand together back to back and then take about 4 steps away from each other. So you might want to get in a place first and try that to see that you have the room. So once you have prepared yourself and the area you are both ready to begin. So let’s begin now. Stand back to back in the middle of the room. Make sure your backs in some places are touching each other. Take some breaths in and out. What does it feel like to stand back to back? What thoughts are you having? What feelings are arising? Each of you should take one step away from each other. Take some breaths in and out. Remember when you were touching? What do the areas feel like now that you are not touching? Take a scan of your body. What are you sensing. What thoughts are occurring? What feelings? Any memories? Remember no need to judge these. Just accept them as they are. Each of you should take another step away from each other. Take some breaths in and out. Remember when you were touching? What do the areas feel like now that you are not touching? Take a scan of your body. What are you sensing. What thoughts are occurring? What feelings? Any memories? Each of you should take a third step away from each other. Take some breaths in and out. What are you sensing? What thoughts are occurring? What feelings? Any memories? Is your mind wandering? If so this is ok. Just bring it back to the present moment. Each of you should take a fourth step away from each other. Take some breaths in and out. What are you sensing? What thoughts are occurring? What feelings? Any memories? Is your mind wandering? If so this is ok. Just bring it back to the present moment. Now turn around and take one step toward your partner. Take some breaths in and out. Now look at your partner in the eyes. Without talking, what are you feeling? What are you thinking? Whatever it is simply notice it. Do not worry about changing it. Take a second step toward your partner. Take some breaths in and out. Now look at your partner in the eyes. Without talking, what are you feeling? What are you thinking? Whatever it is simply notice it. Do not worry about changing it. Take a third step toward your partner. Take some breaths in and out. Now look at your partner in the eyes. Without talking, what are you feeling? What are you thinking? Whatever it is simply notice it. Do not worry about changing it. Take a step toward your partner until you are standing chest to chest. Take some breaths in and out. Without talking, what are you feeling? What are you thinking? How does it feel to stand this close to your partner? You can now arise from this exercise, by taking a step back. Powerful thoughts and emotions can be stirred during this time. Did you feel any walls? Did you feel any vulnerability? Journaling by writing or drawing about your thoughts feelings and sensations can be helpful at this time. Once you have completed that, discuss with your partner what you were thinking and feeling. Share as much or as little as you feel comfortable. Remembering that you each are being very vulnerable right now by opening your hearts. I hope this exercise in particular has been helpful. Remember to return to this session, which is session 42 as often as you need when you feel you need to reconnect with each other. I have really enjoyed this mini-series as it has given us a chance to slow down in this hectic life. I feel better, do you?